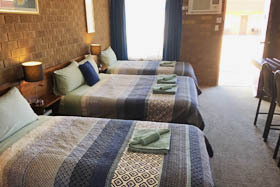 At the Camellia Motel in Narrandera there are 15 ground floor rooms which are all Non Smoking with designated parking right outside the door. Room Service meals are available. 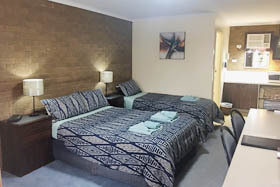 The motel is ideally situated with ease of access from the highway and within a short stroll to the local shopping area, restaurants, cafes and clubs. There is a diverse range of well appointed, recently renovated motel rooms all offering Free WiFi & Foxtel. The recently renovated Deluxe Queen rooms offers a delightful ambience. 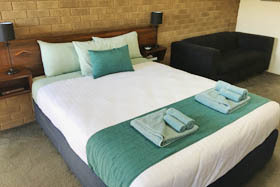 Featuring NEW Ensuite, 32" HD LCD TV, tea/coffee making facilities plus FREE Foxtel and WiFi. Relax in the refreshing décor of a Deluxe Twin Room offering a queen and single bed. Indulge in a spacious shower in the New ensuite or enjoy Free Foxtel and WiFi. A Standard size family room with ensuite. Accommodation suitable for Mum, Dad and two kids or 3 individuals. 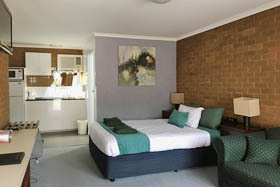 New 32"HD LCD TV, Aircon/Heating, FREE Foxtel & WiFi plus tea & coffee making facilities. 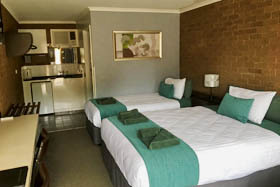 This Twin share room with a double & single bed has a warm cosy ambience. 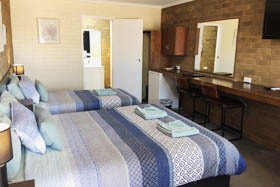 The bathrooms have been upgraded, there is Tea/coffee making facilities, a 32" HD LCD TV plus FREE Foxtel and WiFi. A Large L shaped Family Unit with ensuite. Accommodation has two separate areas each with new 32"HD LCD TV. The facilities include a full size fridge, microwave, tea & coffee making facilities (not an equipped kitchen) and dining table. There is reverse cycle Aircon/Heating, ceiling fans and ‘FREE Foxtel & WiFi’.